This Irish photo album features an all over shamrock design on the cover. This Irish photo album is white with green shamrocks on the cover. 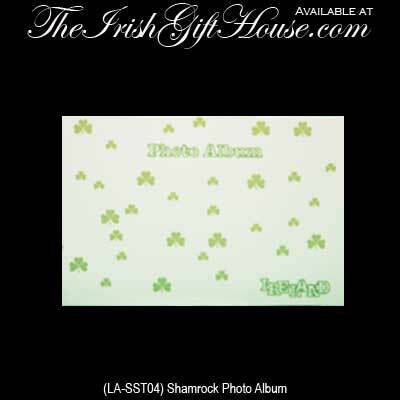 The shamrock picture album is made of coated, heavy card stock paper and it holds 24 4" x 6" photos. The Irish picture album is made in Ireland by Liffey Artefacts and it is received with a shamrock history card, complements of The Irish Gift House.